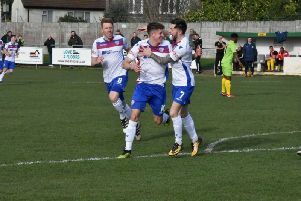 Andy Peaks felt it was a case of “two points dropped” after AFC Rushden & Diamonds and St Ives Town battled out a dour 0-0 draw at Hayden Road. Diamonds maintained their unbeaten home record this season but were unable to register a third win of the Evo-Stik League South Premier Division Central campaign. It proved to be a frustrating day with chances few and far between while Liam Dolman hit the crossbar with a second-half header with their best opportunity. And Peaks said: “I picked a team to have a go with two wide players and two centre-forwards. “The onus was on us to get at them and create chances and we weren’t good enough, certainly in the first half we were nowhere near the standard we need to be at. “I don’t think we had the rub of the green in the second half because we hit the bar and we had a big shout for a penalty which everyone else thought was handball but the referee didn’t. “I did say before that we have played well and not got anything and it almost turned the other way because we didn’t play well and almost nicked it. “They were well organised, I knew they would and they did exactly what we thought. We have just got to be better in the final third. Diamonds will be back in action on Tuesday night when they make the short trip to Kempston Rovers in the first round of the Southern League Challenge Cup. And Peaks is keen to make full use of the fixture ahead of next weekend’s clash at Needham Market. “I think it’s a game we want and need, I think it’s better than training,” he added. “It’s not helped us with things being a bit stop-start. We had to sit and wait after the Royston game aside from the Hillier Cup match at Peterborough Northern Star. I think we need a run of games to get back into it.